Even as the mercury rises, we crave noodles. Luckily, there are styles of noodles, such as udon, that are served chilled. 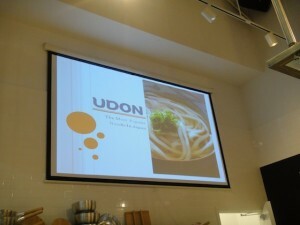 Just as with barbeque from around the US, udon varies regionally. 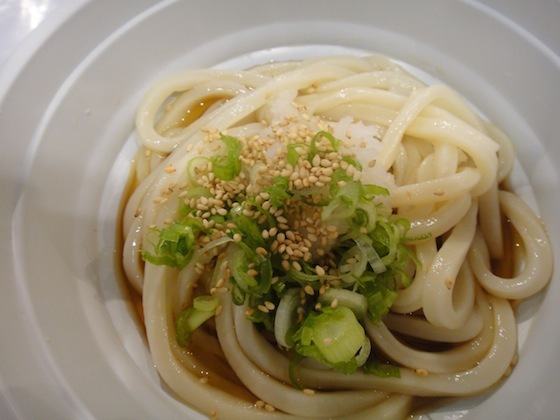 From Akita Prefecture in the north – thin noodles that are similar to pasta – to the very soft noodles of Fukuoka in the south, udon is enjoyed in many different ways. It takes fourteen days to make udon in Gunma Prefecture, making Mizusawa udon the thickest and hardest in Japan. 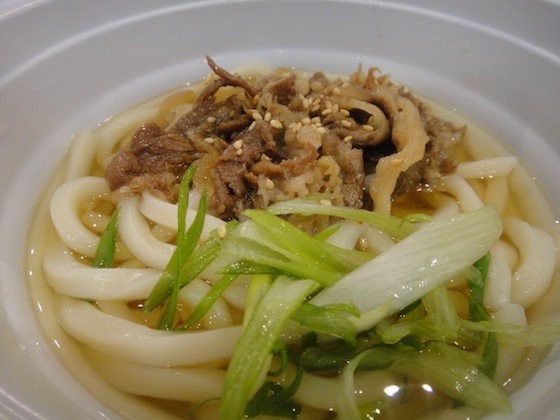 Kagawa Prefecture on the island of Shikoku boasts Sanuki udon, Japan’s most popular udon and Onya’s specialty. The thick noodles have a smooth surface and “koshi,” or chewiness of texture. 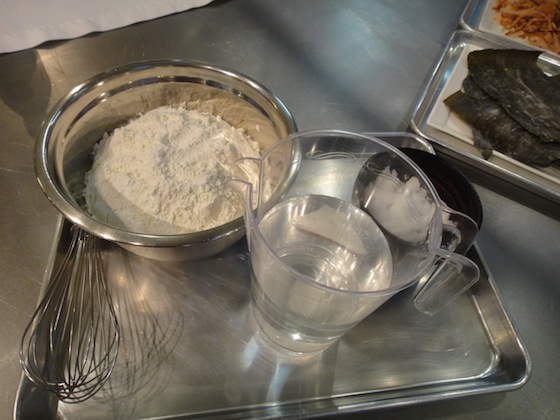 Udon, no matter what style, is made from the simplest ingredients: Flour, salt, and water. But that doesn’t mean udon is easy to make. In fact, the process for making the noodles from start to finish takes more than a day. Twenty ounces of water and 2.2 pounds of flour require stirring, kneading, resting for two hours, more kneading, resting in the fridge overnight, and more kneading before being rolled flat and cut into strips. 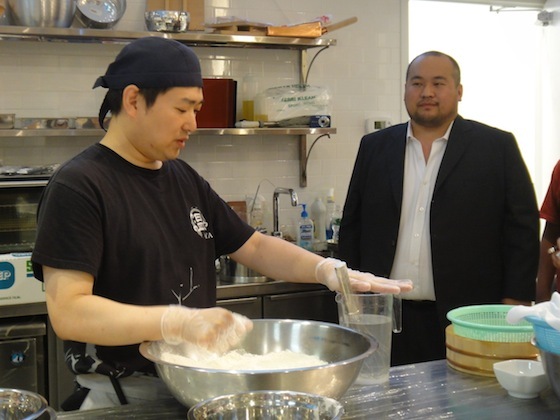 Watanabe demonstrated the noodle-making process, and then he showed us how to make the broth, which consists of dashi (dried bonito flakes, a seaweed called kombu, and anchovies) and kaeshi (soy sauce, mirin, and sugar). 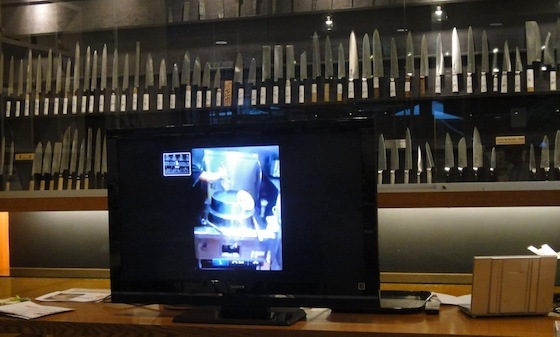 After Watanabe’s presentation, the class was treated to a live look-in at Onya’s kitchen a few blocks away from the Japanese Culinary Center. 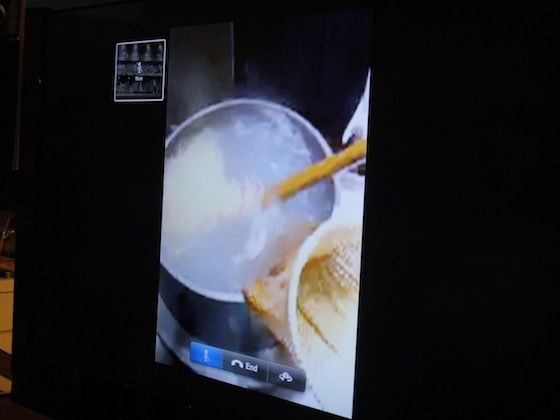 Using FaceTime on an iPad, we watched the noodles being boiled and stirred in a giant vat of scalding hot water. Minutes later, we were treated to those same noodles. The staff at Onya brought us samples, one chilled and topped with scallions and grated daikon, one hot and topped with scallions and beef. Both were equally delicious.